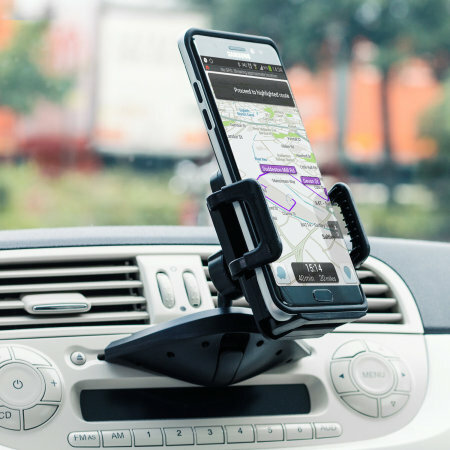 Safely and securely mount your smartphone in your vehicle with the hassle-free CD Slot Mount Universal Car Holder from Olixar. Featuring a quick release system for effortless docking and full case compatibility. Would of liked more details on the mounting. I didn't realise such a device existed until a friend said that it was a pity I couldn't mount my mobile phone using Google maps onto the dashboard. So I search and found it! It's so easy to install/uninstall and holds my mobile secure and it's adjustable! This is brilliant! Holds mobile phone simply and effectively without need for fixtures. Easy to fit and remove if want to put a new CD in place. Item description correct arrived on time . More than happy with item. The base of the unit is solid and nice and secure in the slot. That bit I like. However, the socket for the ball joint is only screwed onto the clamp with a small screw. This failed pretty much straight away. I didn't bother sending back for refund as on the whole I like the product. A bit of gorilla glue has fixed the socket to the clamp mechanism and looks good for now. It works perfectly and is easy to set up. It fits well, into the cd slot. Easy to view the phone from this position. Top notch, after some skepticism. I love my Olixar CD slot Phone holder. However, I did not realize I was ordering from “over the pond,.” When I did not get my usual 3 day delivery I have come to expect, I got a little miffed. I apologize for my impatience, you did well getting my holder to me within a couple weeks. Excellent phone holder. I bought it after reading one reviewer rating it high for Mini's and happy I did. Great quality, very easy to install and really is perfect for Mini, sits in ideal position. I'd imagine it'll be great in any car if using the CD rom is the best possible option. Also thanks to MobileFun. It was my first purchase with them, placing an order was super easy and delivered super fast. Cheers!! Simple to fit and use. No instructions needed. Solid, well made, fixes firmly. Far better than previous holder stuck to the windscreen, perfect solution given that the cd is never used (car has usb port for music). This is my second one of these phone holders. The first one simply wore out through constant use. Ultra easy to set up and it has the advantage that you don't roast your phone in front of an air vent or block part of your car windscreen. Nothing. This is my second one. I'd bought several phone holders in the past but none were good enough to carry on using. This holder is perfect. Really solid. It even takes my phone with its wallet case on. Shame it still comes loose. Holds quite well but does come loose. The triple charger not here yet? Does what it is advertised as doing, which is good. Great product, works well in my car. I like this design and it hold my Huawei 20x very well. Easy to put together, it fits snuggly into the cd compartment. It twists easily in every direction. Good all round product. No vibration, adaptable to various car fascias. easily adjustable to different phone sizes and viewing angle, can work with phone in landscape or portrait alignment. Assorted components to allow for adaptation to various c.d slot situations. Not the cheapest of devices, but neither are the phones nowadays and it is a worthy component of in-car telephone use. if info was clear and it is everything it claimed. I am very happy with my cell phone holder. have recommended it to all my friends. I bought this with very low expectations for a Chevy Cruise, mostly cue to the extra material at the bottom of the CD mount. I really did not think the grip for the phone would work well and planned on modifying it with another mount. However the mount was way better than I expected. Warning in the Cruise, it completely blocks the radio controls except for the volume. That works for me as I only use the aux mode for input from another device so the volume is the only radio control I have ever used. The phone holder is way better than expected and am very happy with it as is. I bought it knowing it was suitable. This is by far the best car holder I’ve bought. I can position my phone to face me, so that when using it as a satnav I only have to glance momentarily because it’s facing me... perfect. It also accommodates my phone case with plenty of room to spare, should I go for the bigger iPhone XS Max. Like how the arms are tilted inward so i can slide my phone in . Looks good but does not securely fit the Ford C-Max 2015 - works loose and falls out. Also the phone grip mechanism does not work well. This is the perfect solution for my iPhone. Really easy to put together, seconds to set up in the car. Grips the phone really well without damaging.. easy to remove, so portable if you’re changing cars. Perfect. For the price, this is amazingly good. Will leave review in new year as bought as Xmas present, so not been used yet. You do wonder about the durability but using it for several months they do the job. Seeing is believing. This system is not too bad, though for Aussie buyers the products come in from overseas. I am tired of screen sticker holders which fall off the screen, usually at a critical moment. This holder can not fall off! It is held firmly in the CD slot. I have a wide phone and it is held easily by the variable slide. My problem is solved. Not suitable if you still use the CD slot. Product was exactly as described and so simple to install. It comes with spacers for the CD player but I didn't have to use them, it has a push down lever lock that is very sturdy, multi angle positioning and the base where your phone sits on has an opening that allows your charging cord to fit through for those phones that charge on the bottom, the holder has rubber grips to keep your phone steady and in place and a button to release the phone is easily done one handed, it does not obstruct your driving visibility at all. I'm very much pleased with purchasing this product and would highly recommend it. I was not using the disc slot so this phone holder was the solution for my need. Easy to install and is incredibly sturdy. Highly recommended. It would help to have CD compatible slots listed if possible. I eventually got it in the slots but it required a bit of brute force and ignorance. Works a charm for the note 9 and hefty case all the same. Really good quality and sits well in the CD player. Holds my galaxy s8 plus really well. Interestingly, the product comes with no instructions. No paper, no information on the packaging. I couldn't even find any information on the Mobile Fun website. You have to guess how to assemble it. Most of it is pretty self-explanatory, except for the three little pieces that came with it. I still don’t know what they are for. My guess is that they are spacers, because they are identical, except for the width. They perfectly fit on top of the “lip” (not sure about the correct term) on the mounting part of the holder (base) that fits in the CD slot. If you put a piece on that lip, it will become thicker. I have no idea why you would need a spacer. The CD slot is thin enough for the base. In fact, the CD slot on my car turned out too thin. The base just won’t fit in it. As I was trying to insert the base in the CD slot, the screw that attaches the arm to the cradle came out of the plastic stripping the thread. The screw is way too small. I was able to fix it by replacing the original screw with a screw about twice as thick and almost twice as long. The phone is held in the cradle by rubbery brackets on two sides. If you squeeze them together really tight, the grip is snug, but it's not very easy to achieve that with one hand. It would be better to have a button at the back of the cradle so that the brackets would snap closed as you push the button with your phone. For a long time, I didn't know there was a foldaway support at the bottom—again, because there are no instructions. As I was writing this review, I looked at the pictures of this phone holder on the Mobile Fun website and noticed that it has a bottom support. However, the position of that support is not adjustable, and the side brackets may cover the buttons on the sides of the phone. Releasing the phone is not easy with one hand, either. The release button is hidden behind the phone and not easy to reach, especially if the phone is wide. To push that button, you would have to reach behind the phone with your finger, or even with your thumb if you have a steering wheel on the right side and have to do it with your left hand. 3. Flimsy screw holding the cradle. 4. Bottom support not adjustable. 5. Not easy to operate with one hand. Still, I like the idea of using the CD slot for mounting the phone holder. The arm is short enough, providing limited bouncing. If it fits in your CD slot, I would recommend it. Just make sure your CD slot is in a convenient location and the phone will not block access to any controls or interfere with the gear stick. I wanted something that would fit my new note 9 and this does it perfectly. It feel safe and skits into the CD slot with different fixings. I'm very pleased with it and would recommend it and the price was also very good. The best phone holder I've used. I was a little sceptical when I read the description, a lot of Chinese produced accessories are useless, this one breaks the mould. It is a good fit, easy to install and holds the phone firm. Holds Huawei P Smart securely in cd slot which is set high on dash. All details were on the site. There was nothing else I needed to know. I read the negatives online about this not being secure so bought one to test and it worked just fine as long as I adjusted the fit with the supplied spacers. It will fit either way up and this helps to position the phone out of line from necessary components such as buttons or reversing screen etc. It worked so well on all my three cars that I have now bought one for each of our three cars (Mercedes SL, Toyota Prius and Hyundai i30). This is a good bit of kit that doesn't rattle (although the jaws have to be firmly shut if there is no phone for that to be the case). It wobbles a little with a phone in it on bumpy roads but it is still the best that I have seen. The reason why it doesn't get 5 stars is that the jaws clamp around the phone too far so that significant portions of the screen are hard to get to. You can see them but if you need to touch it there - that is the problem. A button in a nav app is my problem. Any phone without some kind of bezel around the screen is going to have this problem. I am going to try and find some soft rubber to go in there to reduce the problem and maintain the excellent grip because everything else is damn near perfect. Only used it a few times. It’s great so far. This item is easy to assemble and fit in to car. In the short time I have used it, it has performed well. Good communication, prompt delivery. Exactly as described. This is a super price of kit. Such a good idea as the holders that fit into the air grill don't always face the right way. This holder is really good and does away with those awkward suction pads that stick on the windscreen. This holder fits into the CD slot very easily and makes the screen lower so as not to obscure the windscreen. I am very pleased with it and would have no hesitation in recommending it. A product not commonly available in the many high street shops and a great alternative to the windscreen sucker. Fits perfect in my cd player. Easy go install and pretty stable holder! Not that impressed with the item as it's a bit wobbly and flimsy to be honest. I was well pleased with the product at first, but then the spring mechanism holding the phone in place gradually became awkward to set and has since completely failed, rendering the item utterly useless, having been used very infrequently. Not robust - not recommended. This is a really useful mobile phone holder that slots perfectly into the CD slot. It comes with a couple of extra clips in case your CD slot is wider but I didn’t need them. There is a flip clip underneath that locks it securely into the slot. The grip on the phone is good and expands easily for all devices. Overall I’m really pleased with it and a good price. Exactly what I was looking for, sturdy and holds my iPhone no problem. This is a reasonable quality holder and would be ideal except it is not universal. It simply is not compatible with the Sony audio in my 2012 Ford Focus Titanium. I'll keep it until I get a car that it will fit but until then I sourced an alternative. my phone charges from the bottom so I cannot use the clip down rest to hold the shone high as shown and it does slip down over time. The phone obscures the radio display in my car. This holder simply slots into the CD player of your car and you lock it in place with the lever and it's secure and sturdy. I have an iPhone 6 Plus and the holder opens wide enough to easily slot my phone in. There is an opening at the bottom so you can fit your charger through too. You can either sit your phone upright or sideways for easy viewing. This has caused absolutely no damage to my CD player whatsoever and it really does work like magic. Highly recommended! Fits snugly into CD Slot. The only problem is nothing to do with the item itself its more to do with the position of my CD player in relation to my gear stick. Its close and keep catching it when I change gear but with an adjustment to my hand position while changing gear its ok. Just got to remember my hand position when doing so. This is a great product. As previous reviews have said it works really well, the clip holds the phone securely and it locks into the opening of the CD player easily and safely. My only issue was the length of time I took to receive the item. 5-7 working days was specified initially, I contacted the company after 14 who advised that it may take up to 20 working days and it arrived on the 20th day. Too slow! This product was purchased for a Merc A Class. I found it to be strong and well made but somewhat awkward and in the way. It is large and might be in the way of other buttons. I found this product well put together and did the job I wanted it to do. I would highly recommend this product glad to find a well built product. It looked like it was something that might be what I wanted. It has proven to be an excellent choice. Holds the phone securely in an easy to see position, easy to adjust, easy to attach & release phone. if you don't use your CD player and if it's positioned in a handy location in your car, this phone holder is excellent. brilliant. if you don't play CDs in your car anymore and your CD slot is in a handy location this is it. works perfectly well. love it. Overall it’s an excellent product. Holds your phone safely and securely and still allows you to connect a charging lead. It also provides you with a good clear view of the screen in many different angles. The only downside is because it’s in the cd slot it does obscure your view of the cd/radio buttons. Also in my particular car due the location of the gear stick I bumped the whole thing out with my hand a couple of times until I got used to it. Money well spent! Securely holds my phone, no magnet strips required to go on the phone, no ugly windscreen holders that get in the way. Cannot fault, good quality. This is a good product. The holder is very stable in the cd-player which I have never put a cd in so no problem there. The stalk that holds the phone maybe a little long as it does vibrate a bit, but my phone is quite heavy which may explain it. The only other issue which is no fault of the product, is the clamp is pushing on a 4 way radio button which prevents it from working. Overall a great product and good price, well done! My GPS rubber suction cap for the windscreen perished. Tried different methods to secure, but no luck. Bought the Olixar CD slot mount to hold unit. With the natsav being thicker, wasn't sure if it would grip. Have put it to the test riding over many humps in my street and it hasn't fallen off yet. Am happy with this purchase so far. The best phone holder I have seen on line. Easy order process. Great company to deal with and efficient delivery. Won’t be the last purchase I make from them. Brilliant mount. Very sturdy and stable. Exactly what I wanted. Grab one now! !